The hotel has character. It’s literally a block off of the Quarter near LaFitte Blacksmith pub. Great spot! The staff is extremely helpful and did what they could to make for a positive experience. The matress could afford to be updated but the room itself is charming with antique type furniture. Very cool old guest house. Close walking distance to everything. Bed wasn’t comfy and the frame was broken. Plugs in the room needed to be updated, cords kept falling out. Breakfast is minimal fruit and eggs were old. There was an envelope to leave a tip for a housekeeper but no one cleaned our room the whole time we were there. The staff was not very friendly. A clerk asked us to move our car after it had been parked and not moved for 2 days. We literally moved it over 2 feet for no reason. There was no vehicle next to us. Stanley the cat was very sweet however and welcomed us everyday with a pur and a hug! We called for a late arrival (after 6pm) and staff were waiting at the door to let us in...they were very accommodating and even carried my bags up the winding staircase to my room. We had a very nice 2nd floor room with 2 double beds and my sister thoroughly enjoyed the quaint ambience of this quiet little hotel! We woke up to a lovely breakfast on the veranda and fresh sheets and towels each evening...i will definitely stay here again!! We enjoyed our stay. The manager was very friendly and helpful. The lobby, room, and courtyard area were all very cute. It could use a little fixing up. The parking lot was very tiny. It was extremely convenient to walk everywhere we wanted to go. Over all, I'd definitely stay at the New Orleans Guest House again. This hotel is nothing fancy, but it's a unique place to stay and the staff is friendly. We had a great time. Can't beat the price and location. We'll be back! Hotel is located at the edge of French quarter. It is an old and charming building among many old buildings and houses nearby. it is within walking distance of Bourbon street and others so I walked thru many of them. I stayed on second floor next to stairs. Room was quiet. However when walking in the room, the floor makessome creaky noise but I am ok with it. Toilet flush is a little weak. The hotel staff is super nice and helpful. Ask them for recommendations for restaurants that locals frequent. The hotel is quite charming and for the price you can't beat it. Close to the Seanger Theatre and to the Quarter (but not too close so you don't get the noise, traffic and odors :) ) The staff were all quite nice. Cute, old hotel with a lot of character. Room was small, but had a tv, mini-fridge, dresser and closet space. If forced to come up with complaints: the bed wasn't the most comfortable thing we've ever slept on and our room was right next to the door to the courtyard, so it was very noisy in the morning. i would like to express gratitude to the front desk staff member who was working when we checked in. She asked where we parked and when we said near a corner, she let us know that even if there's no sign or colored curb, you still can't park on a corner in New Orleans. She probably saved us a ticket and/or towing. This hotel is in a historic building. It's beautiful and the rooms are very nice. There is a sweet central courtyard. Three friendly cats roam the outdoor space, which was a huge plus for me. The only negative was that it was a little noisy during breakfast since my room opened into the courtyard. Someone also knocked on the door around 9, waking me up. I had a very late night on the town and would have loved to sleep later than that. It wasn't that big of a deal, though. I enjoyed the stay and would definitely go back. Nothing to spectacular to speak about but the other occupants in the hotel were very nice and socialable. Some of the staff did everything in their power to make sure my stay was comfortable but the hotel itself wasn't as impressive as I thought it would be! Was a great location for what I was their for. The staff was so helpful with all my needs. I will go back for sure. Located in Treme, New Orleans Guest House is within a 10-minute walk of popular sights such as Bourbon Street and Louis Armstrong Park. This 14-room bed & breakfast welcomes guests with conveniences like free breakfast, free in-room WiFi, and a terrace. Free continental breakfast is served each morning from 7 AM to 10 AM. A TV comes with cable channels, and guests can stay connected with free WiFi. The bathroom offers hair dryers and free toiletries. Other standard amenities include a ceiling fan and an ironing board. 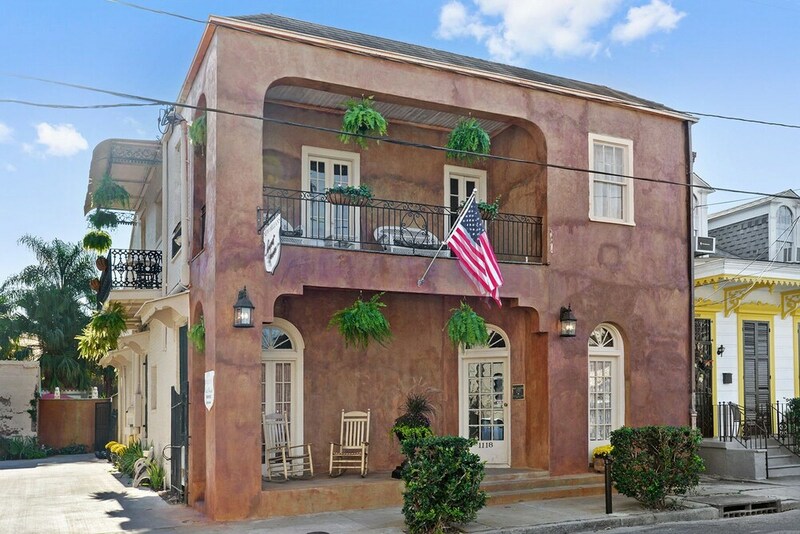 At New Orleans Guest House, guests have access to free WiFi in public areas and a terrace. Self parking is offered for USD 25.00 per night. Front-desk staff can help with tours or tickets, and provide local restaurant recommendations. Thank you for your kind words! We appreciate you taking the time to review us. We are slowly but surely completing some renovation projects at the hotel. Come back and stay any time! I'll be happy to offer you a repeat guest discount! The preferred airport is New Orleans, LA (MSY-Louis Armstrong New Orleans Intl. ): 23-min drive, 15.8 mi/25.5 km. This property's front desk is open daily from 7 AM - 11 PM. No alcohol is served at New Orleans Guest House.